That might be a high quality rubber dome, but it's still a rubber dome. I haven't really tried it recently, but I always felt depressing keys on my Model M was a bit harder than it should be. The connector--fair enough. I use my Das Keyboard with PS/2 for full n-key rollover, plus of course PS/2 sends an interrupt as opposed to being polled. Pre-USB Sun keyboards use plain old serial ports at 5v without handshake lines ( so a 6 pin DIN connector has room for two - the keyboard itself and the mouse ), so no polling there either. I'm not sure what you're referring to anyway, the only keyboards I'm aware of that are actually polled are ADB, and there ( at least on PowerPC-based macs ) the microcontroller on the mainboard does the polling. 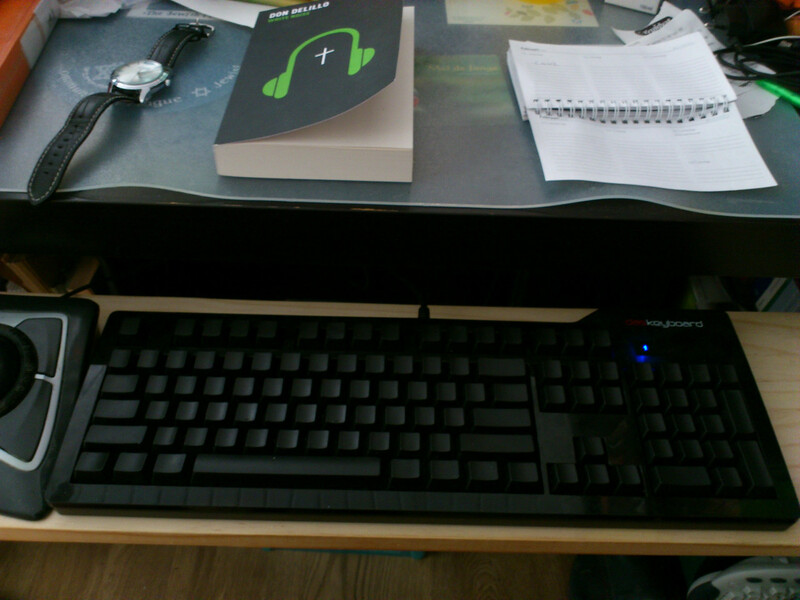 It would seem that I use a yet another keyboard layout that is neither ANSI, nor ISO. There's also the Unix layout. You'll note Ctrl and Caps Lock are switched, and the presence of a real Compose key. Anyway, I'm afraid that I find your enter key an odd crossbreed between ISO and ANSI. What I dislike about ISO is not so much the enter key, although I prefer the smaller yet more accessible ANSI one, but the fact that there's a \| button where the left Shift should be. I can't stand that antagonist to proper typing. Hmm, it's harder than most keyboards, but actually not that much harder than my Type 7. Older Sun keyboards are a little bit softer though. Like you indicated, USB is polled (and slower). That's the same then, except mine has Dutch keycaps. So I stick to mine's older, neener, neener. I agree. That's the key I expect to be under Return, and which is generally found on the right hand side of the keyboard. Under? I expect it on the top right of return. But regardless where the \| key is, the shift keys should be freaking symmetrical. The Compose key sounds like a Linux feature. I have never used it, and I have never seen support for it in Windows. But it sounds similar to the Dead Key. Unix. But yes, GNU/Linux is Unix-like. Anyhoo, there's third-party software to provide similar functionality on Windows. I prefer the explicit compose key mechanism to implicit dead key mechanisms. My layout is US International, which allows for easy typing of Dutch, German, French, English, and several other European languages. My pre-USB Sun keyboards are like that, at least the Type 6 was available in UNIX or PC layout, with Sun or USB interface. Type 7 is USB only, mine's PC layout but they all have compose keys. I raise you an Apple Extended Keyboard II from 1991. Nowhere near as loud as a Model M, despite having actual switches, and just as heavy & sturdy. It's a little bit smaller though. Oh, if fast response times are what you're looking for you better get a HP HIL keyboard & mouse. The HP9000/345 I used to have ( my first NetBSD box... ) came with that - the keyboards are weird, the mice are extremely responsive and accurate ( since the bus is MUCH faster than PS/2 they can - and will - transmit far more position updates per second ). HP switching to PS/2 was a huge downgrade. Interesting, I'd never heard of that. I'm not looking for fast response times per se, but the only thing I lose by using PS/2 is the ability to easily plug my keyboard in and out. What I gain are potentially faster response times and full n-key rollover. I understand you should be able to do something similar for keyboards, but nothing officially supported. There's a similar trick for pre-USB Sun mice - just crank up the speed of the serial port. Most can go quite a bit faster than the 'standard' rate. Here's the kind of keyboard I dream of You get the general idea? I want the caps lock key out of the way! They didn't show you the other photo. You get the general idea? I want the caps lock key out of the way! But you don't need a special keyboard for that: just tell your OS to treat the Caps Lock key as an extra Control key. As I'm sure I've said, I use Caps Lock as Compose. Btw, if you ever do get one of those, please share your impression of the Topre switches. Although, I suppose that may not necessarily be the most useful if you don't have a buckling spring (Model M) or some Cherry switches to compare to. But the thing is that I need caps lock function often enough. Is caps lock mappable to a key combo when I reassign the key to some other function? * Not actual shouting. It's just I haven't missed Caps Lock at all since I disabled it. And actually typing that sentence by keeping Shift pressed and swapping the Shift-pressing pinky around automatically while I was typing barely slowed me down either. I know what Caps Lock is useful for. On a (mechanical) typewriter you use it for headings, and holding down shift is just freaking heavy. But let's face it, we've been using electric typewriters for decades now. Being a translator, proofreader and book editor, I have encountered whole paragraphs and even chapters in all caps. But you are right. I could learn the shortcuts to set chunks of text to uppercase and lowercase. Word processing software can do it. I use it from menus when needed, but I could learn the keyboard shortcuts or whatever else works in all the different editors. ...chapters? I don't even want to know. Not only there's a delay between when we press and the letters appears in the screen but wireless keyboards always chose the worst time for getting out of battery and it uses to happen instantaneously. Here's the keyboard of my bestest laptop. There are also other machines with other keyboards that I use. I will eventually post those too. Not bad at all, although it somewhat kills right Ctrl. I hardly use right Ctrl. Also, I wish Caps Lock were designed differently, positioned differently. After experimenting various ways, I finally determined that I need Caps Lock on this particular keyboard the way it is. The Caps Lock comes with a light on it that shows if it's on or off.